In hindsight, going to NAHBS on the weekend of Het Nieuwsblad and Kuurne-Brussels-Kuurne might have been a bad idea as it prevented me from providing you the most up-to-date commentary on the weekend’s action. That said, last week was probably to most popular and well-read week in Pavé’s 1-year history—for that, I thank you. So even though many others have beaten me to the punch in providing coverage and analysis on the weekend’s events, I’ll still share what I noticed—after all, this is Pavé, right? 1. 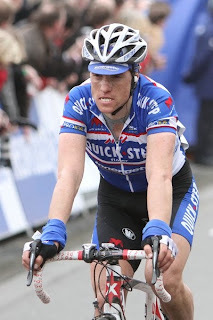 Nick Nuyens has to be wishing he either: a) rode for Quick Step; or b) was named Tom Boonen, as it might have earned him some neutral support inside the last 30 km of the race. While it can be understood why he had no team car—the gaps were too small between groups and the roads were too narrow—it’s hard to imagine why it took so long for even a motorcycle to arrive with a fresh wheel. Maybe they were taking a break for a pintje before the finish? Maybe they were all waiting with Boonen in case he triple-flatted? Regardless, it cost Nuyens a chance for the victory, and is certainly embarrassing for the organizers. No matter what happens, there has to be at least one moto at the front at all times. Tire choice was key on a day when punctures ruled. Photo by Van Wichelen. 2. That said, it’s not Roubaix, but the section where Rabobank punctured is one where I might have thought—if I were Rabo’s DS—of planting a few wheels with team staff on foot just in case someone flatted at a time when support couldn’t be had from a car or moto—which is exactly what happened. Teams do it at strategic points in Flanders and Roubaix, why not here? It was clearly a section where the race was going to blow apart; I would have rolled the dice and had a wheel or two waiting after the Molenberg, the Taaienberg, and the cobbled Paddestraat and Lippenhovestraat. While not the result he wanted, Boonen can feel good about his form. Photo by Van Wichelen. 3. 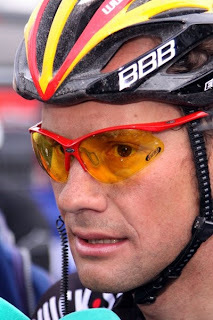 And speaking of the Taaienberg, Tom Boonen’s attack there was breathtaking. I’m not sure how deep he went, but he rode away from everyone at a rate that has to strike at least a little bit of fear into the minds of his competitors. No one was able to follow his wheel, forcing Boonen to soft pedal while waiting for someone—anyone—to join him. One can only wonder what the outcome of the race would have been had he not flatted several kilometers later. Chavanel and Quick Step are feeling the heat following a poor weekend. Photo by Van Wichelen. 5. 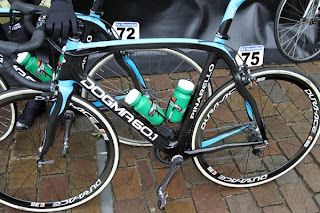 As for Quick Step’s main rival, Omega Pharma-Lotto, the day went a bit better albeit with similar results. I’m not sure why, but most media outlets claim that Flecha was the first to initiate the attacks inside the final 20km—that wasn’t the case. Gilbert attacked first; Flecha countered and then accelerated once he realized Gilbert was riding at his limit, ultimately pulling away for the win. The wild card here was Jurgen Roelandts, who rode a fantastic race in service of Gilbert. His one mistake was perhaps hesitating a bit too long when Gilbert attacked. It was the safest decision, as he would not have wanted to make a move that might have harmed Gilbert’s chances for the win; but Guesdon and Curvers were hanging-on by a thread—Roelandts could have left them easily to join his teammate in the winning move. He tried to bridge once he realized the frailty of his companions, but it was too late to bridge before Flecha counter-attacked. I’m left wondering what would have happened had Roelandts immediately ridden-away with the other two—would Flecha have dropped him as well? Roelandts can only ponder what might have been. Photo by Van Wichelen. Regardless, at 24 Roelandts seems to have all the makings of a solid classics rider. He if can continue to progress over the next few weeks, he’ll prove a valuable asset to Gilbert and Hoste later in the spring, perhaps making the loss of Johan Vansummeren a bit less detrimental to Lotto’s chances for a win in Flanders or Roubaix. 6. 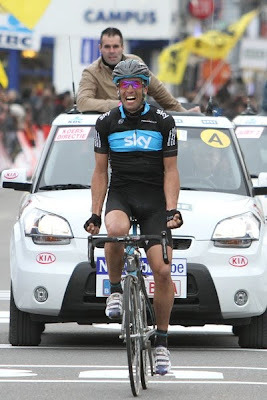 As for Flecha, give him and Team Sky credit for a well-deserved victory. Sky rode a smart race, almost finishing 1-2 had Boassen Hagen not started his sprint a bit too soon. 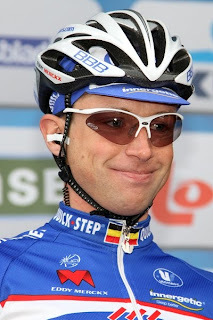 Flecha’s win was the first for a Spaniard and only the 10th time a non-Belgian has won the Omloop. Another 2nd-place finish for Haussler. Photo by Van Wichelen. 7. And 2nd on the day? 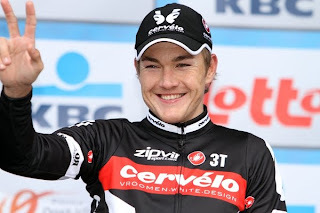 Yup, Heinrich Haussler. His knee clearly not bothering him, Haussler rode an aggressive race, ultimately missing the only move that mattered. His quest for a monument win will be one of the main stories throughout the next six weeks. So close! Photo by Van Wichelen. 8. 3rd place on the day went to Garmin’s Tyler Farrar. Kudos to Farrar for hanging-in all day to take 2nd in the field sprint—another 10 meters and he might have nipped Haussler. If Farrar continues finds his top-end speed in Tirreno, he’ll have to be considered one of the favorites in Milan San Remo a little more than 10 days from now. Here’s hoping the rest of his team’s up to the challenge as well. Devolder wasn’t smiling after the race. Photo by Van Wichelen. 9. Finally, several top favorites were clearly content to treat patience as a virtue by taking a more reserved approach to the races this weekend. Several of the men we thought would play leading roles were more content with cameos including Pippo Pozzato, Stijn Devolder, and just about everyone on BMC—a team whose performance has me more than a little worried. This was the last we saw of BMC. Photo by Van Wichelen. All in all, it was an exciting weekend of racing that typified all that we love about springtime in Belgium. From here the action moves to France and Italy with Paris-Nice and Tirreno-Adriatico before kicking of the monuments with Milan-San Remo. Share your comments with the rest of below—what stood-out to you from the first Belgian weekend of the year? Thanks again and enjoy your week! 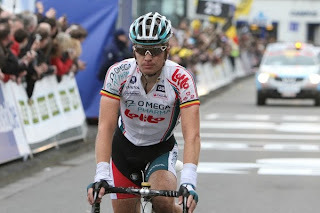 This entry was posted in Races and tagged flecha, het nieuwsblad, monday musette, nuyens, omloop, report, roelandts. Bookmark the permalink.